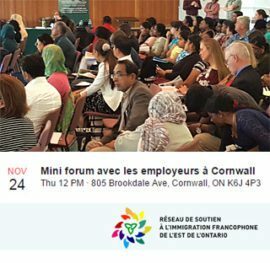 Cornwall Ontario – Employers and job seekers will have a chance to connect at an upcoming event organized by the Réseau de Soutien à l’immigration francophone de l’Est de l’Ontario (RSIFEO). The event takes place Thursday, November 24th at the Ramada Hotel on Brookdale Avenue. The event includes training for job seekers as well as workshops aimed specifically at employers. The two groups will meet in a “speed-dating” exercise that will provide an opportunity for face to face interaction. 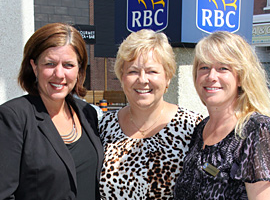 This is the second event that RSIFEO has held in Cornwall. The organization has a mandate to ensure the economic integration of French-speaking immigrants into Canadian society. Cornwall’s large Francophone population and numerous French-language schools makes it an ideal community to promote to newcomers. Job Seekers will have the opportunity to hear from a number of presenters throughout the day, including Job Zone d’emploi and the Conseil de la coopération de l’Ontario. The highlight will be the opportunity to speak directly with employers. Admission is free, however participants are asked to register by November 18. Employers will have the opportunity to hear about available support from senior levels of government from Lynne Groulx, Senior Business Advisor with Ontario Ministry of Economic Development and Growth. Additional workshop on managing diversity in the workplace, will also be provided. 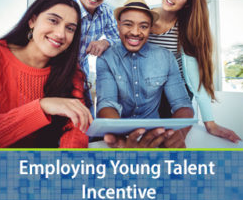 Employers, businesses looking to add to their workforce, entrepreneurs, Human Resources managers, and individuals working in supervisory capacities will benefit from this workshop. The Réseau de Soutien à l’immigration francophone de l’Est de l’Ontario (RSIFEO) is funded by Immigration, Refugees and Citizenship Canada and provides support to French-speaking immigrants.